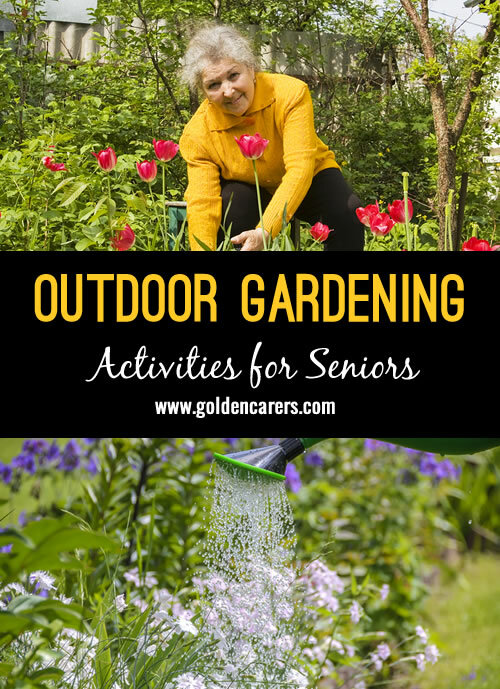 Gardening is a wonderful physical and emotional activity for seniors. It is an opportunity to reminisce about times gone by while reaping the benefits of sunshine, fresh air and gentle exercise. This activity is suitable to small groups, say 3 or 4 residents. Gardening sessions should last 40 minutes to 1 hr. Shovels and other gardening tools may be adapted to the needs of individuals. Plastic plant pots donated by staff, relatives and neighbours. Plant cuttings, seeds and seedlings. If you don't have an elevated garden bed, you can make do with a couple of tables joined together and a plastic table cloth. In my personal experience I find that plant cuttings are preferable than seeds, however you may try both. Find a suitable outdoor area, away from the sun. Give each resident a small shovel. If they want to use gloves assist them. Start the activity by filling pots and demonstrate by planting a seedling or small cutting. You will be surprised how they will get involved in this activity with minimum guidance. Encourage residents to water pots and other plants around the facility with small watering cans. Encourage resdients to reminisce about their own garden. Talk about plants and vegetables they used to plant. Ask which is their favourite and how they ate and cooked their vegetables. In our garden area we have 3 raised garden beds. One for succulents, then herbs and finally flowers. A few residents help to look after these and other just enjoy being outside. I always tell them afternoon tea is included...The area is enjoyed by staff and families. Also we have a small vege patch built by the local High School boys. The tomatoes and basil are growing like mad, told staff to pick them regularly to keep them growing. Finally its a pleasure to have this special area! This sounds wonderful Karen! It is so satisfying to nurture and watch herbs and flowers grow. We just got some amazing gardening tubs. At waist height the residents are up to them everyday, watering and weeding ..Lots of TLC ......and conversation held over the plants! Gardening seems to be a very popular activity with seniors since so many worked in gardens in their life time. I brought in a very eclectic variety of seeds which seemed to delight the folks and maintain interest. I found more farming stories came from the men in the group and they shared their knowledge of how to work large fields and crops. So interesting! We are very fortunate to have a beautiful garden area at our facility and during nice days the seniors want to be stay outside for hours! We have a large hat rack full of many styles plus sunglasses and sunscreen by the entrance so our folks stay protected. Come on summer! oh yes you are fortunate Wendy! Thanks for your feedback! Here in Australia we are entering Autumn after a lovely long summer. I am finding this web site very interesting as i have being do lifestyle for 12 months and thoroughly enjoying it but sometimes you need more ideas thank you everyone for your ideas. Thanks for your feedback Sherrie, it is much appreciated. Instead of small shovels you could use second hand spoons and forks.